Every year I say it so I’ll make no excuse for doing so again. The World Snooker Championship may start on April 20th for some people, but we know better don’t we? 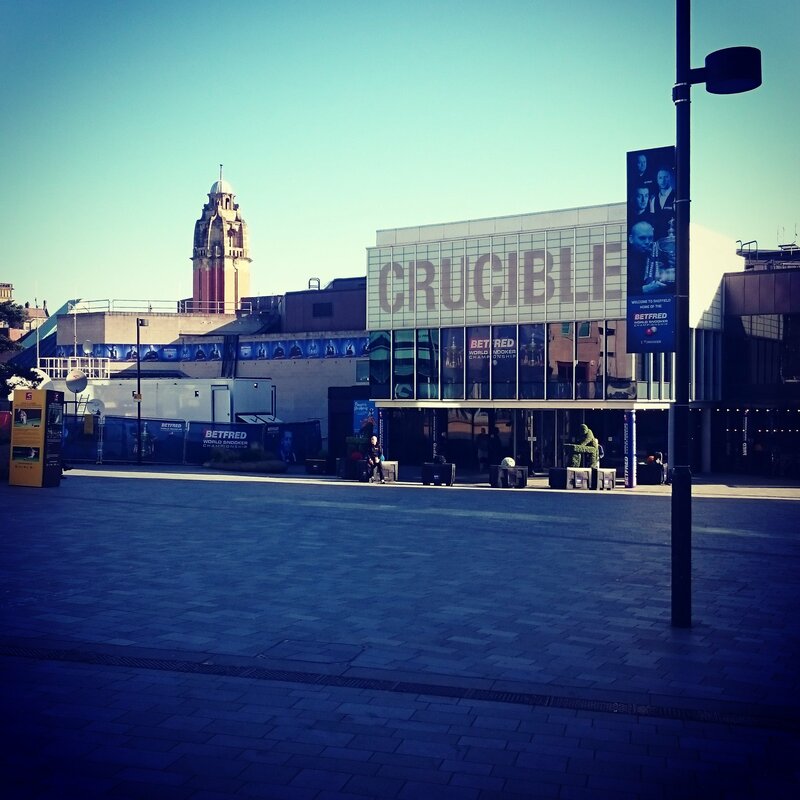 Because we know that it starts on Wednesday, when the first balls are struck in Sheffield at the qualifiers, in what for me is the second best stand alone event of the season, behind what is to come at The Crucible. The joy on the players faces who make it through this is plain for all to see, no player wants to finish their season watching the big one from their living room, knowing that they had their chance to be there, but the majority of the 128 starting out here will be doing just that, but while they are still in the mix, there is hope. Once again the host venue is the Sheffield Institute of Sport, which last year took over from Ponds Forge and this move seemed to be popular with the players, if not as convenient location-wise for the fans. You should think of these as 16 mini-tournaments within one big one, each consisting of eight players, with four quarter finals, two semi finals and a final in each section, whittling down the 128 players, which includes 15 invited amateurs to the 16 that will walk out at The Crucible in a couple of weeks time to face one of the seeded players. The final day, or Judgement Day as it is now universally known by Team Anorak, is just fantastic. Rob Walker and Neal Foulds ramp up the volume in snooker’s very own version of Super Saturday, so if you haven’t booked that day off work or are otherwise engaged, cancel all plans and get sat in front of your chosen device to watch it, you won’t regret it. Once this is done and dusted, the following day sees the draw for the main event and we’re then just a day away from it all starting at The Crucible, making April the month which snooker fans love the most. So to the matches, for convenience I have split this up into the 16 sections, all you need to do is decide who qualifies from each one, easy eh? This post will concentrate on the ‘To Qualify’ market and not on individual matches. I’ll be doing seperate posts on matches as the three rounds progress. Ryan Day will be on a lot of people’s shortlist when it comes to players who they would expect to qualify with ease this week, but as we know there is no such thing as a cast iron certainty in snooker these days (though that said, a match in section 7 comes pretty close). He’s got a tricky opener against Oli Lines and a tough second match whoever he plays, Tian Pengfei still being a very dangerous player when he is on song. That’s even before we look further down to a possible run for Matthew Stevens who to me always looks more at home in the longer format. There we also find Chris Wakelin, who qualified last season and ran Judd Trump so close at The Crucible. Day has been a bit off the boil lately and I think he is possibly worth opposing in this section, he has only played Stevens twice over the longer format and both times Matthew has won with a bit to spare so I’m going to take Stevens to qualify again here. Predicted Crucible Qualifier: Stevens to outfire Day on Judgement, ermm, Day. Dominic Dale has indicated that he intends to retire from snooker when he drops off the tour but with him pretty safe now in the one-year rankings we’re not likely to be saying goodbye to The Spaceman just yet, I’d expect him to beat Chris Totten but after that a possible match with the dangerous Gary Wilson who meets Sandi Lam first up will for me signal the end of his World Championship for another year. In the bottom section Liang Wenbo lurks, but his form of late is extremely patchy and nothing is ever guaranteed with him. David Grace has had a great season in the amateur game and has been rewarded both with a tour card and a place in this. It would be quite odd if he were to meet Liang in the second round given that not that long ago they battled in the UK Championship semi-final, but he has to get past Rory first which won’t be either easy or pretty, Rory himself is in danger of falling off the tour and a loss to Grace would seal his fate. But I think the Leeds Giant has a shot of a place at the back end of this with his confidence extremely high and the future bright, but for me Wilson is probably one of my stronger fancies to qualify. Predicted Crucible Qualifier: Wilson to beat Grace on Judgement Day. Robbie Williams is something of a qualifiers specialist but this section sees dangers at every corner for the Merseyside man. His opener against Sam Baird is far from easy and he then may face Marco Fu, who is just not the force of old lately, perhaps because of the issues he has had with his eyesight. But for me the qualifier from this section will come from the bottom two matches. I expect Sam Craigie and Tom Ford to both win their openers and Sam showed in China recently just what a player he is when he is on-song and I’m sure he has his sights set on The Crucible this year given his strong late season form. He’s played Ford once before and beaten him in a decider and I reckon if they do meet it could again be very close, a real coin toss that one but I fancy the winner to kick on and qualify. Predicted Crucible Qualifier: Ford to outscrap Williams on Judgement Day. Anthony McGill has some vivid recent memories as both a qualifier and a seed of The Crucible and showed some signs in China that his form was returning after a quiet season for him compared to recent years and he’ll be favourite to return to the main venue from this section. Despite the fact that Duane Jones now has a ranking event semi-final behind him I’d take McGill to be lining up on Judgement Day but against who? Sunny Akani is a bit of a cult figure with some snooker fans, unorthodox doesn’t quite cover it when it comes to his technique but it does get results and you’d expect him to be facing Rob Milkins in the second round, I think the key to that match will be Milkins not getting frustrated with Sunny, as some have in the past to their undoing, they have never met before. Either way, I think McGill is the player to be on in this section, he has a 100% record against Milkins and I don’t see the level headed Scot getting tetchy if he plays Akani. Predicted Crucible Qualifier: McGill to edge Milkins on Judgement Day. The Highland Terrier that is Graeme Dott will fancy his chances in this section I reckon, I can’t see him not making the final round and from there he’ll be like a dog with a bone, snapping at your heels to get it all over with. The bottom section is interesting, I’ve no idea how good the Chinese player is as he only appears to have one match under his belt of any consequence, which he lost, so I’m assuming that we can write him off and instead concentrate on the Carrington v Maflin/Mann match up, of those I think Kurt’s scoring wins the day as Carrington isn’t playing as well this season as he has been though he is still ranked higher than Maflin. Either way, I can’t see either of them getting past Dott, who I think will qualify comfortably from this section. Predicted Crucible Qualifier: Dott to bite Maflin on Judgement Day. It might surprise some that Li Hang is actually the highest ranked player in this section, but the Chinese player has been on the up this season and for me he is the one to beat here. Ben Woollaston comes fresh from his quarter final showing in China and confidence will be high but he faces a very dangerous opponent in Slessor first up. The bottom match sees two tour veterans Mike Dunn and Nigel Bond locking horns and possibly sharing Werthers Originals and swapping tales of their ongoing ailments. While Dunny, despite his mutterings to the contrary, looks set to stay on the tour, it will be goodbye to Nigel unless he has an unlikely run in this, if Mike can stay off his sick bed for a week I think he’ll see this as a section he can win, but for me this is one which will see the first Chinese player coming through. Predicted Crucible Qualifier: Hang to beat Dunn on Judgement Day. I could go for the obvious wisecrack that Martin Gould mostafa chance of coasting through his first match but that would be both juvenile and unfair on an opponent who, as far as I can find, has only ever managed a 60 break once in any of the competitions where records are held, put it this way, Gouldy has had to do a lot more for ten grand in the past I’m sure. He’s been a little anonymous this season Gould, then he came from nowhere to win the Championship League in March after his last outing saw him pumped 6-0 by Rod Lawler, very strange. He has dropped to 30th in the end of season rankings just ahead of who I think is his biggest threat in this section, Iran’s Hossein Vafaei. Vafaei as all snooker fans know is a very talented player and I’m sure one day he’ll break into the top 16, I can see this being a match up between Gould and him on Judgement Day and after two meetings they are 10 frames each, this could be all about conkers this one. Predicted Crucible Qualifier: Hossein to pip Gould on Judgement Day. Another player making noises about retirement at the end of the season is Peter ‘Brexit’ Ebdon, he finds himself in a very cosmopolitan section of the draw with a Cypriot, an Austrian, a German and a couple of Chinese players, it’s almost like the snooker gods are playing a joke on him. Anyway, he has a potential banana skin (sorry I can’t help it) with Chandler first up, but despite showing plenty of promise, Harvey doesn’t win very often, I’d say then Ebbo would have sufficient in his vegetable drawer to make it past Georgiou or Lee Walker, though if it’s Walker there will surely be a sudden deluge of refs phoning in sick that day. In the bottom section Yan Bingtao stands out and judging by his ranking status he really should fly through to Judgement Day despite some mediocre form lately, if he does I think he’ll have built up enough momentum to take care of Peter, but of course part of me would love to see Ebbo back at The Crucible just one more time, but I fear for him this week, leave does really mean leave with neither a short or a long extension. Predicted Crucible Qualifier: Bingtao to beat Ebdon on Judgement Day. The big hitter in this section is of course Ali Carter, The Captain’s match against O’Sullivan last year will live long in the memory for all sorts of reasons, most of them bad tempered, and I am sure he will be disappointed not to have secured a Crucible spot as of right. He has however been handed a plum draw through to Judgement Day with a possible match up against Jimmy White in the second round, the lad Jimmy is playing is not a pushover by all accounts, though the occasion may just be a bit much for him you’d suspect. The bottom section sees the much talked up Yuan Sijun facing John Astley before possibly then meeting a stiff task against either Michael White or Andy Hicks. White has really plummeted down the ranking list these last two seasons and his confidence seems a long way from the days when he was in the top 16 and lifting the odd trophy, the experienced Hicks will fancy his chance there I reckon. But can any of them stop Carter? I don’t think so, clear the runway on Judgement Day for The Captain. Predicted Crucible Qualifier: Carter to beat Hicks on Judgement Day. The head to head between Walden and Burden shows that with the exception of when they first met, they do have very close matches and despite the fact that Walden is way ahead in the rankings I do think they are pretty evenly matched. When it comes to recent form however, Walden showed a bit in China while unbelievably Alfie is yet to win a match in 2019. From the bottom two matches you have to fancy the highest seeded player Zhou (or as Dennis calls him Ghou Yolonge), Liam Highfield has not kicked on after a good season last year and I just can’t see the injury prone Robin Hull or Hammad Miah getting close to the Chinese player. The amateur David Lilley who takes on Eden Sharav can’t be ruled out of the top section either so that’s quite a tricky one to predict. Either way though I’m plumping for another Chinese player to make it here. Predicted Crucible Qualifier: Yuelong to beat Burden on Judgement Day. A couple of experienced players who are on a really bad run of form of late are Fergal O’Brien and Dark Mavis, their opponents in the top section, particularly the young Welsh prospect Jackson Page cannot be ruled out springing surprises there and even making it all the way to The Crucible, but Fergal as we know tends to thrive over these longer matches and you’ll have to scrape him off the table, a possible second rounder against Rod Lawler could very well break all records and put the timetable back a few days. In the bottom section I can look no further than Lu Haotian, for me now he is currently the best Chinese player outside Ding and I expect him to qualify from this section whoever he faces. Predicted Crucible Qualifier: Haotian to beat O’Brien on Judgement Day. I think most of us would like to see the swashbuckling Un-Nooh qualify here, he’s infectious to watch when in full flow and finds himself in what I’d say is a very winnable section indeed. Mark Joyce isn’t quite the threat he once was and is another who is winless in 2019. I’d fancy the decent Billy Joe Castle to come through that one but can’t see him getting near the Thai player. In the bottom section Jimmy Robertson will take all the beating and he does hold a 3-0 head to head advantage over Un-Nooh over shorter matches. Despite the presence of fans favourite Joe Swail in that section I can’t see anything other than an Un-Nooh/Robertson shootout for the Crucible here. Predicted Crucible Qualifier: Un-Nooh to outgun Robertson on Judgement Day. You’d imagine that all the players on the left hand side would come through in Round 1, though amateurs Sargeant and Cahill are no pushovers. If that does happen we will have the sixth meeting between Michael Holt and Andrew Higginson and guess what? Higginson has never beaten him. Up at the top, Guodong will be looking to further the Chinese feel to the qualifiers but he’ll have to be patient if he faces Peter Lines, who can grind down the best of them. So for me Holt will face either Xiao or Lines on Judgement Day, whoever it is, I think the Hitman will prevail. Predicted Crucible Qualifier: Holt to beat Lines on Judgement Day. Ken Doherty proved that there is life in the old dog yet in China by beating Mark Williams, but as with all players as they get a bit older it’s the consistency that he seems to struggle with and that’s not great going into 3 best of 19’s. Scott Donaldson and Craig Steadman both enjoyed themselves in China with Scott making his first ranking semi-final, so it’s a shame that two form players meet in the first round as both will really fancy their chances. The winner of that match I’d say will have too much for Ken and in the top section I’d be looking at the experience of Mark King coming through. I’d plump for a Donaldson/King final here and I wouldn’t be surprised if it went to the wire. Predicted Crucible Qualifier: Donaldson to pip King on Judgement Day. The Sheriff of Pottingham should get an automatic place at The Crucible for having both the best nickname and coolest walk on tune in snooker, but sadly the powers that be don’t act on my emails. There are a couple more amateur players in this section but I’d be surprised if they survived long against their professional opponents. I’d fancy the Hamilton/Selt and Zhao/Noppon match ups in round two and the Thai player is one that I rate highly, he’s a heavy scorer and despite an indifferent run of results just recently is looking like being in the top 32 at the end of the season. It’s just that recent form that stops me plumping for him here and instead going with recent first-time ranking winner Selt. Last but not least the second highest seed after Day, Joe Perry, finds himself in the girls section. You have to say that Joe has been handed a pretty decent path to the final for a player of his ability and having two less strenuous matches ahead of Judgement Day can be beneficial in preserving energy. Whoever he plays you suspect will have come through in a less pedestrian way. Martin O’Donnell’s early season form has seen him catapult up the rankings but results lately haven’t quite been up to that purple patch. Alan McManus is always a threat over this longer format and despite now being more recognised for his verbal dexterity and extravagant taste in cravats than his exploits with a cue he should never be taken lightly. I’d say this section won’t see a media dream all-female duel on Judgement Day but rather one between two experienced older pro’s each trying to return to the sport’s finest venue. Predicted Crucible Qualifier: Perry to outfox McManus on Judgement Day. Doubles/Trebles/Acca on Ford 11/2, Haotian 11/5, Yuelong 12/5, Holt 10/3. Trebles/Fourfolds/Acca on Haotian 11/5, Donaldson 15/4, Selt 11/4, Wilson 5/2, Vafaei 9/2. Acca – (pays 37/1) Un-Nooh, Perry, Dott, McGill and Bingtao. Added: 13/10 at Black Type Bet on at least 6 of my selections winning. Added: 80/1 at Black Type Bet there being no debutants at The Crucible this year. Tickets: There are two official box offices for this event. They are SIV Tickets and See Tickets.